My Meyer Lemon tree has been very prolific since I planted it 3 years ago. This spring, it blossomed like crazy (as usual) but it seems to be dropping leaves and I do not see any new green growth. What can I do? This can cause “root rot” and the tree will try to get rid of the excess moisture by dropping leaves. This can be fixed by adding a bag of gypsum of around the entire perimeter of the tree and breaking up the ground with a shovel. I’m not sure of where the idea of watering at night started, but it is never a good idea. Most mature trees only need water 1-2 times a week for about 5 minutes or so. If your tree is in the ground with grass surrounding it, the runoff from the grass is usually more than enough. 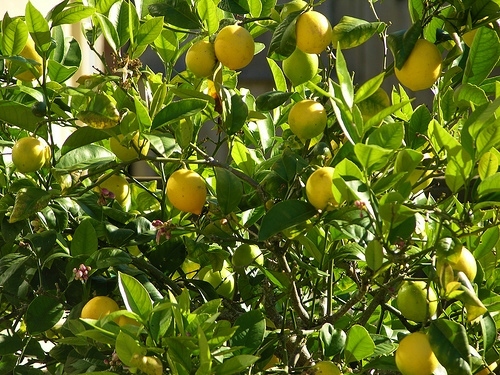 Everything and everyone needs to eat and this includes your citrus tree. A decent fertilizer formulated for “Citrus and Avocado” will do the trick. Apply every 4-6 weeks during the growing season for in ground plants and every 3 months for potted plants. Remember to read the label as there are a few types of Citrus fertilizer and too much will cause inferior fruit. David’s answer is right on depending on where you live and how much rain you received. This will be the deciding factor on how much water to give to your citrus tree. Here in Southern California, we have been experiencing a lack of winter rain which has had effect on our back yard citrus trees. The winter rains usually provides sufficient moisture for a nice spring bloom. The last 3-4 years here in SoCal, the winter rains have not done that for us. As a result we have had to do some extra water to our citrus & fruit trees. When you first planted your tree, the branches were probably close to the base of the tree. The area where the branches end is called the “Drip Line”. It is in this area that the tree should be fertilized and watered. Many people make the mistake of always watering at the base of the tree. Once the tree is established and the branches have started to grow, the feeder roots will keep pace with the “Drip Line” of the tree. When you purchased your citrus tree, it was probably in a 5-7 gallon container. This means when it was planted, the root system was already about 12-16 inches below the ground. 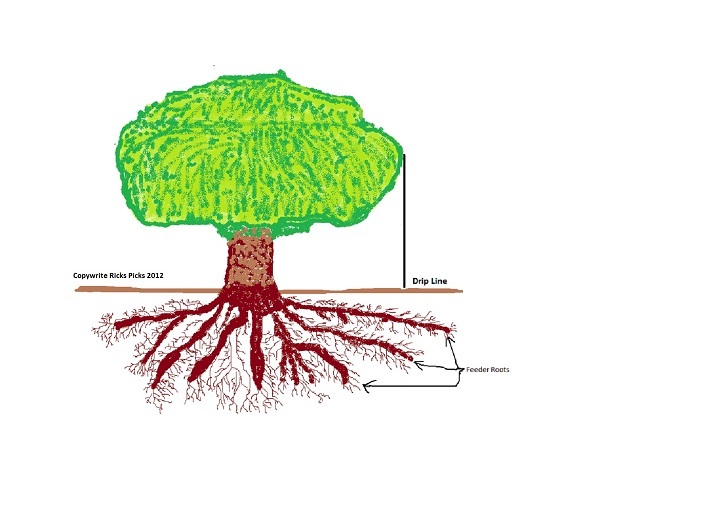 Initially you watered your tree right at the base because this is where the root system was located. When watering an established citrus tree, you will want the water at the Drip Line and allow the water to percolate down to the feeder roots system. Citrus trees will do well when the drench method of watering is employed. When I water my 30 year old Tangelo and Washington Navel Orange trees, I will water each quadrant about 20-30 minutes. I only do this once a week to every ten days, depending on the weather and the amount of fruit on the tree. Once your citrus tree has been properly hydrated, you can fertilize your citrus tree every 6-8 weeks at the drip line. Another issue that might be plaguing your tree is soil compaction. In this situation, the water will actually roll off to the side and not penetrate into the ground around your tree. 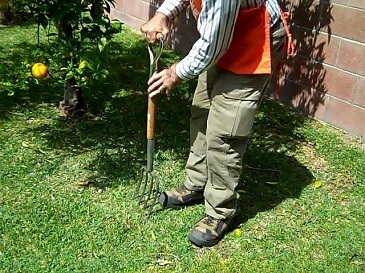 In this situation, I use my heavy 4 tined Garden Fork to poke 6-8 inch holes into the ground at the drip line of the tree. Think of perforating the ground in a 2 foot wide swath about every 6 inches around the tree. Once this is done, deep water your tree. If you are in Southern California, try this method and let me know how your tree is doing in a couple of weeks. Please send in some pictures of how your tree is progressing and share yor results with us here on the community.